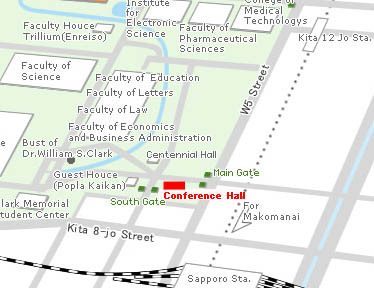 "Conference Hall" is located in the southeasternmost of the Sapporo campas of Hokkaido University. It takes about 10 minutes on foot from the North exit of JR Sapporo station. It takes about 36 min. by JR or about 70 min. by limousine bus. Conveniently situated close to the city of Sapporo, New Chitose Airport has regular direct international flights to various cities overseas, with domestic flights to Japan's main international airports at Narita, Haneda, Nagoya and Kansai as well as other regional airports.